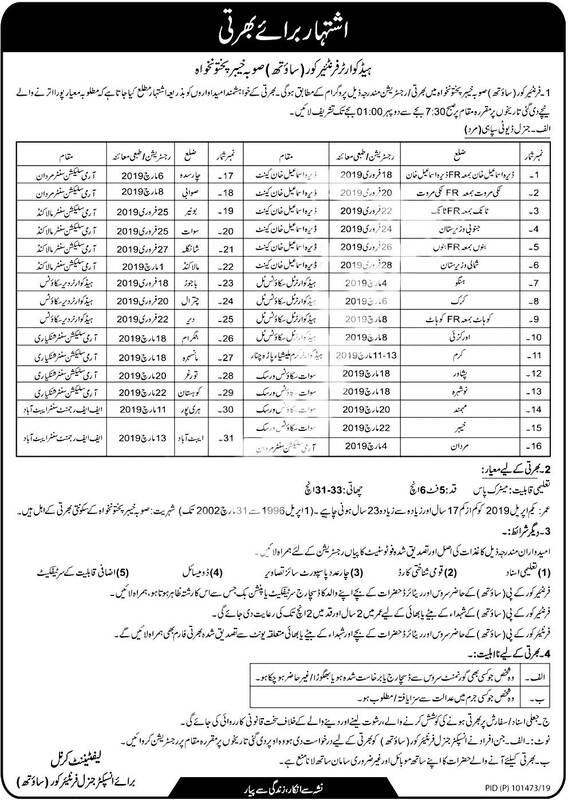 A large number of vacancies in Frontier Corps (FC) KPK have been announced by the official authority and for this purpose; the recruitment procedure has begun. So all the individuals whether they are local residents of KPK province or not, if they are interested in any of the available jobs can get themselves registered for the selection procedure by submitting their application forms to the authorized department. Recruitments will be made from all four provinces of the country for which the complete schedule has already been announced. But before any applicant decides to take part in the selection process, first he should take a look at eligibility criteria for all the available positions before it is compulsory to meet all eligibility requirements otherwise they won’t be allowed to take part in the further recruitment procedure. Listed below are complete eligibility criteria related to age, height and physical measurements which is compulsory to be met by all the candidates. So if you fulfill all these requirements then all you have to submit your duly filled form along with the CNIC, educational certificates, domicile, and 3 recent photographs to the authorized KPK Frontier Corps department till due date. Also remember that any incomplete, incorrect or received after the due announced application forms will not be considered in any possible case.